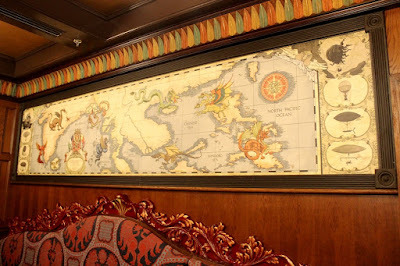 The S.E.A., that the Society of Explorers and Adventurers for the uninitiated, have been woven into many of the stories told throughout Disney parks and resorts. I don’t just mean at Walt Disney World, but parks across the globe, which only makes sense if you consider that the S.E.A. have had adventures all over the world. From secret messages to mess halls, they’ve worked themselves into many facets of the park-going experience. Perhaps no place is more steeped in their lore, however, than The S.E.A. Room, a secret meeting room tucked behind a bookcase, at the Jungle Navigation Co., Ltd Skipper Canteen. Let’s start with Captain Brieux and the Hyperion Airship. These are taken from the 1974 live action film, The Island at the Top of the World. Set in 1907, the film follows Sir Anthony Ross as he attempts to locate his missing son. For this journey he hires Captain Brieux, portrayed by Jacques Marin, who has invented his own flying machine, aka airship, known as the Hyperion. The film is an adaptation of the Ian Cameron’s book, The Lost Ones. Although I would admit it is a very loose interpretation, especially since the Hyperion didn’t even appear in the novel. You can see the airship at the top left corner of the Skipper Canteen’s map, peeking from its hangar. A life-sized variation on this view can be found at Disneyland Paris’ Café Hyperion. Jumping backwards in our authorship line, we are met with J. Chandler. While he has nothing to do with The Island at the Top of the World, he does have an interesting history. Jason Chandler was originally imagineered by tony Baxter as a part of the Discovery Bay concept for Disneyland Paris and would have tied the area into the mining boom of Big Thunder Mountain. While this iteration never came to be, Jason would be resurrected. In 2012, the Magic Kingdom’s Big Thunder Mountain Railroad underwent an extensive refurbishment that included the enhancement of its queue and, by default, its storyline. It was here that a letter from Jason to the head of the Big Thunder Mining Company, Barnabas T. Bullion, can be found, but that’s a tale for another day. He would also pop up in the Disney Kingdoms’ comic series created by Dennis Hopeless and Tigh Walker, Big Thunder Mountain Railroad. In this tale he is a miner working for Bullion who, along with other folks in Rainbow Ridge, have been robbing the gold shipments in protest of how they are treated by Bullion. Depending on how you read the letter in the queue of Big Thunder Mountain Railroad, it appears Bullion and Chandler have buried that hatchet and are on friendly terms. Regardless, Jason Chandler has clearly made a name for himself if, at some point in his life, he was the President of the S.E.A. The stories hidden in the nooks and crannies of Walt Disney World are many, and often times have their roots in the company’s long film history. However, as the Society of Adventures and Explorers continue to add stories and characters to their history and ranks, there is an ever-present tapestry that is slowly coming in to view. I, for one, love the interconnectivity and await the next entry into their adventures.